Every day is a gift and an opportunity to spread the love of the Lord. When we show love to others, we are reflecting the Lord into their lives. Be an instrument in His hands to bring blessing and hope to others. 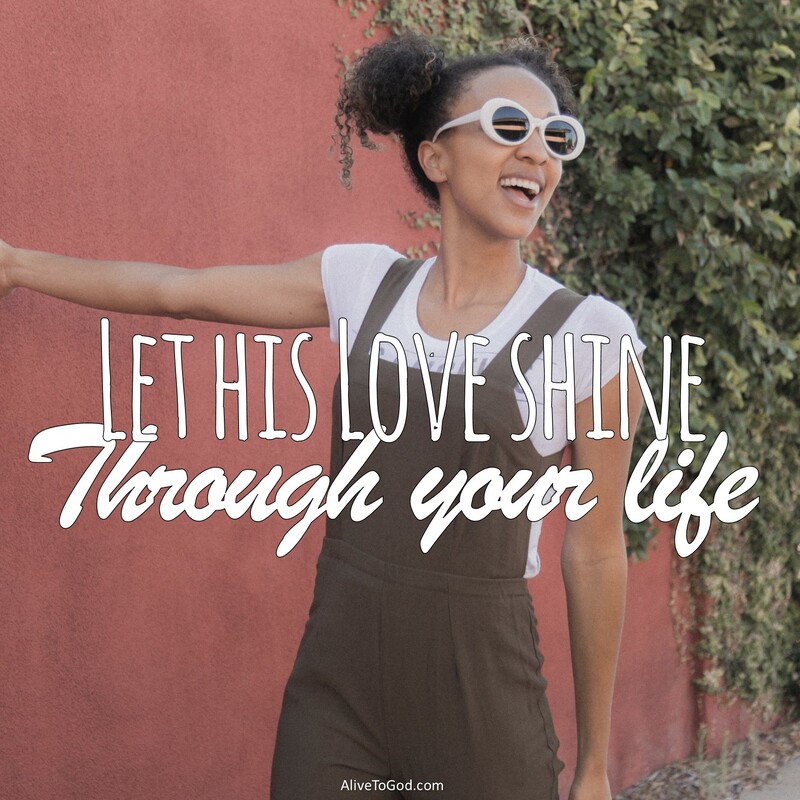 Let His love shine through your life, and in the way you care for others. Prayer: Lord, may my life be a reflection of the fact that I am loved by You and that I love You. Cause my life to be a blessing to those around me so that they will be convinced of Your love for them. Amen. Elke dag is ‘n gawe en ‘n geleentheid om die Here se liefde te versprei. Wanneer ons ander liefhet is ons besig om die Here in hulle lewe te reflekteer. Wees ‘n instrument in Sy hande om seën en hoop aan ander te bring. Laat Sy liefde en hoe jy vir ander omgee deur jou lewe weerkaats word. Gebed: Vader, mag my lewe die feit dat U my liehet en ek U liefhet, weerkaats. Laat my lewe ‘n seën vir almal om my wees sodat hulle oortuig sal word van U liefde vir hulle. Amen. Cada día es un regalo y una oportunidad para esparcir el amor de Dios. Cuando demostramos amor a los demás, estamos reflejando a Dios en sus vidas. Sé un instrumento en Sus manos para dar bendición y esperanza a los demás. Permite que Su amor brille a través de tu vida y por el modo en que tratas a los demás. Oración: Señor, ayúdame a que mi vida refleje que yo soy amado por Ti y que te amo. Permite que mi vida sea una bendición para aquellos que me rodean, para que ellos puedan convencerse de Tu amor hacia ellos. Amén. Chaque jour est un cadeau et une occasion de répendre l’amour du Seigneur. Prière: Seigneur, que ma vie soit un reflet du fait que je suis aimé par Toi et du fait que je t’aime. Fais de moi une source de bénédiction pour ceux qui sont autour de moi afin qu’ils acceptent que Tu les aimes Amen. Ang bawa’t araw ay isang regalo at oportunidad para ipakalat ang pagmamahal ng Panginoon. Kapag nagpakita ka ng pagmamahal sa ibang tao, ating ipinakikita ang Panginoon sa kanilang buhay. Maging instrument ng Kanyang mga kamay na magbigay ng biyaya at pag asa sa iba. Hayaan ang Kanyang pag ibig na lumiwanag sa ating buhay, sa pamamagitan ng iyong pagkarunga sa ibang tao. Dasal: Panginoon, nawa’y ang aking buhay ay maging isang aninag na ako ay mahal Mo at Ikaw ay nasa akin. Gawin moa ng aking buhay na maging isang pagpapala sa mga nakapaligid sa akin par nga sa gayon ay maniwala sila ng Iyong pagmamahal sa kanila. Amen.